The system consists of a submersible pump controlled by a Danfoss VLT AQUA Drive and a pressure transmitter. The transmitter gives a 4-20 mA feedback signal to the VLT AQUA Drive, which keeps a constant pressure by controlling the speed of the pump. 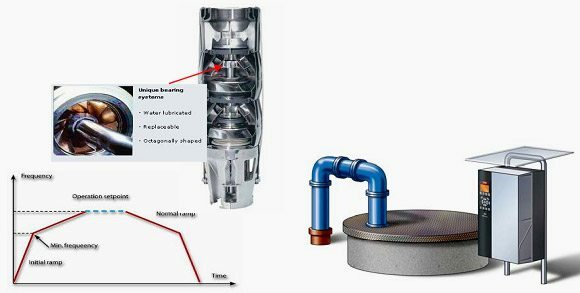 To design a drive for a submersible pump application, there are a few important issues to take into consideration. Therefore the drive used must be chosen according to motor current. The motor is a so called “Can motor” with a stainless steel can between the rotor and stator. There is a larger and a more magnetic resistant air-gap than on a norma l motor hence a weaker field which results in the motors being designed with a higher rated current than a norm motor with similar rated power. normally will be 30 Hz. The motor reactance is nonlinear in submersible pump motors and therefore Automatic Motor Adaption (AMA) may not be possible. However, normally submersible pumps are operat ed with very long motor cables that might eliminate the nonlinear motor reactance and en able the drive to perform AMA. If AMA fails, the motor data can be set from parameter group 1-3* (see motor datasheet). Be aware that if AMA has succeeded the drive will compensate for voltage drop in the long motor cables, so if the Advanced motor data are set manually, the length of the motor cable must be taken into considerations to optimize system performance. It is important that the system is operated with a minimum of wear and tear of the pump and motor. A Danfoss Sine-Wave filter can lower the motor insulati on stress and increase lifetime (check actual motor insulation and VLT AQUA Drive du/dt specification). It is recommended to use a filter to reduce the need for service. EMC performance can be difficult to achieve due to the fact that the special pump cable which is able to withstand the wet conditions in the well normally is unscreened. 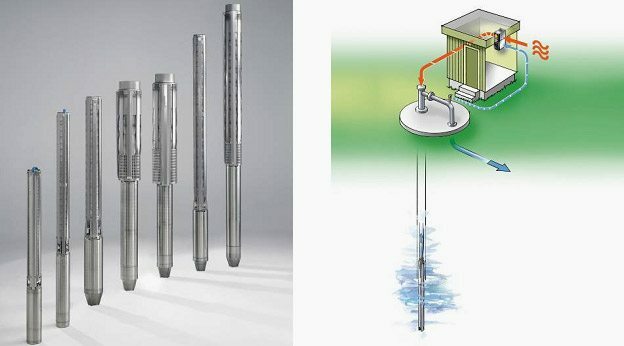 A solution could be to use a screened cable above the well and fix the screen to the well pipe if it is made of steel (can also be made of plastic). A Sine-Wave filter will also reduce the EMI from unscreened motor cables. The special “can motor” is used due to the wet installation conditions. The drive needs to be designed for the system according to output current to be able to run the motor at nominal power. To prevent damage to the thrust bearings of the pump, it is important to ra mp the pump from stop to min. speed as quick as possible. Well-known manufacturers of submersible pumps recommend that the pump is ramped to min. speed (30 Hz) in max. 2 -3 seconds. The new VLT© AQUA Drive is designed with Initial and Final Ramp for these applications. The Initial and Final ramps are 2 individu al ramps, where Initial Ramp , if enabled, will ramp the motor from stop to min. speed and automatically switch to normal ramp, when min. speed is reached. Final ramp will do the opposite from min. speed to stop in a stop situation. Pipe-Fill mode can be enabled to pr event water hammering. The Danfoss VLT AQUA Drive is capable of filling vertical pipes using the PID controller to slowly ramp up the pressure with a user specified rate (units/sec). If enabled the drive will, when it reaches min. speed after startup, enter pipe fill mode. The pressure will slowly be ramped up until it reaches a user spec ified Filled Set Point, where after the drive automatically disables Pipe Fill Mode and continues in normal closed loop operation. This feature is designed for irrigation applications. More details of VLT AQUA Drive, on technical literature page.